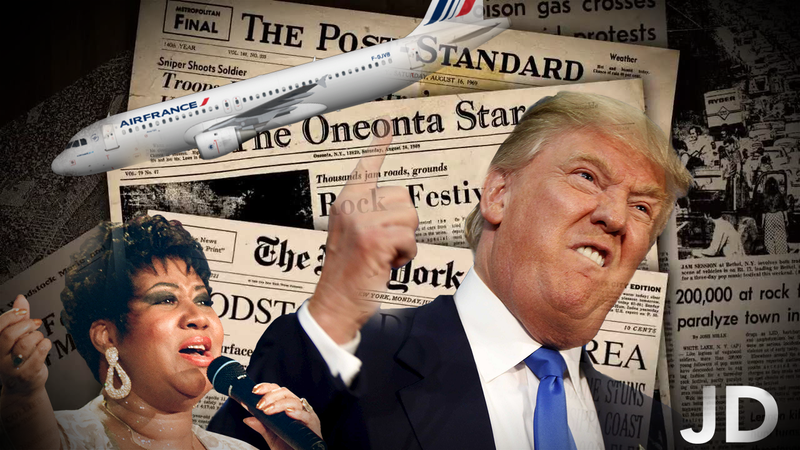 38 – RIP Aretha Franklin, 350 Newspapers against one president, and AirFrance is no longer French? Aretha Franklin, whose gospel-rooted and blues music earned her the title, “the Queen of Soul,” has died, a family statement said Thursday. She was 76. Franklin died at 9:50 a.m. at her home in Detroit, The “official cause of death was due to advanced pancreatic cancer of the neuroendocrine type, which was confirmed by Franklin’s oncologist, Dr. Philip Phillips of Karmanos Cancer Institute in Detroit,” according to the family statement. 350 Newspapers against one president? Around 350 news organizations across the U.S. are standing up to Donald Trump. Many people throughout the press are saying that this is not anti-Trump, it is pro-press. AirFrance new leader may not be French. CNN – “Local media reports suggest Smith could be named CEO following a meeting of the Air France-KLM (AFLYY) board on Thursday. The French state owns 14.3% of the airline group, and its economy minister publicly backed Smith earlier in the day. Representatives for Air France-KLM declined to comment. Air France has not had a foreign CEO in its 85-year history. PreviousPrevious post: 37 – People want the probe to end, Tesla to go private, and everyone wants Trump to say McCain! NextNext post: 39 – Parade Postponed, China’s Combat, and Two-hundred Tapes!